Following is a wide selection of small trees recommended for the St. Louis area. Several are native Missouri species or nativars (cultivars of Missouri native trees). Others are excellent, non-invasive exotics. All should perform well in St. Louis if planted in a suitable location. These trees should mature at roughly 30 feet or less. Some of the shortest may indeed be more shrub than tree depending on how they are pruned when young. Some grow well as a multiple-stemmed tree. Expected size is listed with each tree. To learn what conditions each tree requires, click on the Latin name of the plant (orange text) for more information. Spread: 20 to 30 ft.
Trident maple is a slow-growing, rounded deciduous tree that can be planted along streets, patios and around the home. The triangular, three-lobed leaves are glossy green above and pale green beneath. The fall color can vary, but typically the leaves turn attractive shades of dark red and orange. Exfoliating bark develops on mature trunks. No serious insect or disease problems, but limbs may be damaged in winter by snow and/or ice. Spread: 12 t0 25 ft.
Paperbark maple grows well in slightly acidic, medium moisture soils, and does not tolerate drought. The tree's color varies throughout the season with yellowish flowers blooming in April to early May in clusters of pendulous stalks. The leaves are green above, but frosty blue-green to gray-green underneath. In fall, the leaves range in color from shades of orange to red. The exfoliating cinnamon-colored bark is stunning year round. No serious insect or disease problems. An excellent tree for small properties, it can also be planted as an understory tree in a woodland garden. Spread: 15 to 20 ft. The ‘Bloodgood’ cultivar gives a beautiful color display throughout the year. Purplish-red flowers bloom in the spring and mature to red samaras in late summer to early fall. The foliage has a reddish-purple color in summer, and deepens to a good crimson red in fall. Works well as an accent tree around the home or yard in full sun. Spread: 8 to 12 ft. This cultivar can be planted as a small tree or a deciduous shrub, preferring slightly acidic, well-drained soils. It grows as a spreading mound of twisting branches with leaves lightly tinged with a hint of burgundy along the edges. Leaves turn yellow-orange in the fall. Good for St. Louis areas with afternoon shade as a specimen or group around the home or yard. Height: 15 to 25 ft. Spread: 10 to 15 ft.
Like other Japanese Maples, this cultivar does well in slightly acidic, well-drained soils in full sun to part shade. Prefers some part afternoon shade in the southern parts of its growing range. Foliage color emerges as a dark reddish-purple in spring, with good color retention until late summer, then fading to reddish-green and bronze before turning showy crimsonred in fall. Grows well as a sun-dappled understory tree, a specimen around the home or yard, or in woodland garden margins. Height: 8 to 10 ft. Spread: 10 to 12 ft. This cultivar is smaller than the straight species, reaching only 8 to 10 feet tall. The form is rounded, slow-growing and shrubby, often with cascading branching. It's also noted for its excellent purple leaf color throughout the season and red color in the fall. Plant as a specimen tree or group around the home, yard or patio. The ‘Tamukeyama’ cultivar is a mound or dome-shaped tree with weeping and cascading branching. The purplered leaves are deeply dissected and turn a brighter red color in the fall. In a landscape, use as a specimen or accent tree around the home or yard, or in a sun-dappled area as an understory plant, or along a patio. Spread: 25 to 30 ft. This species is known for its ash-brown exfoliating bark. The trifoliate leaves turn from green to vibrant shades of orange to red in autumn. Excellent for small landscapes and specimens around the home and grows easily in average, well-drained soils in full sun to part shade. Leaves emerge as reddish-purple in spring, but mature to dark green. Fall color display can include shades of yellow and orange, and sometimes with purples and reds mixed in. Good drought tolerance when mature. No serious insect or disease problems. A multi-trunked Missouri native with beautiful white blooms appearing from March to April. Flowers give way to berries which are edible when they turn a dark purplish-black at maturity. Exhibits good fall color. Great as a decidous tree or a small shrub for woodland, naturalized or native gardens, and tolerant of clay soils. Spread: 15 to 25 ft.
‘Autumn Brilliance’ is a multi-trunked hybrid cross between two species of serviceberry. It grows well in medium moisture, well-drained soil in full sun to part shade. Like other serviceberries, it produces edible fruit that resembles blueberries in taste and attracts birds. The name ‘Autumn Brilliance’ references its brilliant orange-red fall color. Good understory tree/shrub for lawns, shrub borders and woodland/native plant areas. Spread: 9 to 12 ft. The 'Little King' cultivar is a compact, deciduous and multi-stemmed tree that is noted for its orangish to brownish exfoliating bark. The flowers are insignificant. 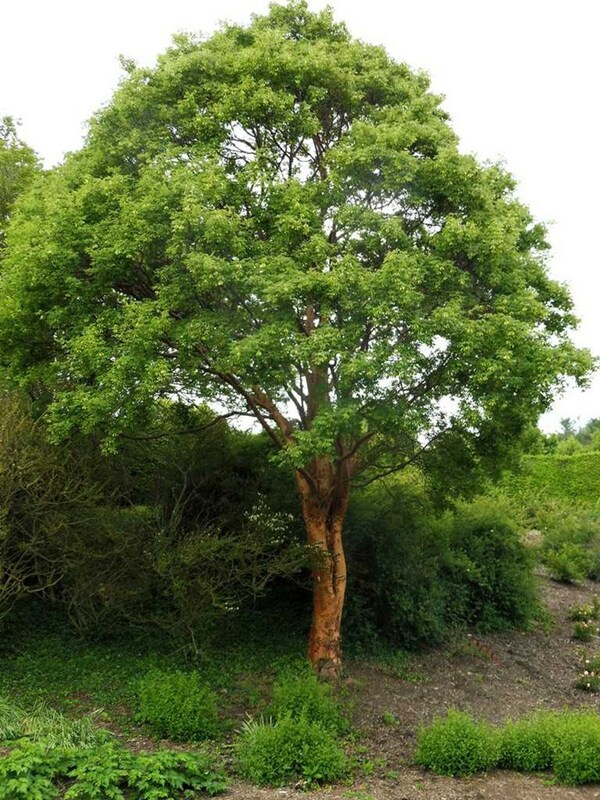 The tree prefers medium to wet acidic soils and can be planted as a specimen tree or in small groupings for lawns, parks and commercial properties with wet soils. This cultivar is extremely resistant to the bronze birch borer and has good resistance to leaf spot disease. ‘Royal White’ is a cultivar of the popular Missouri native redbud tree (Cercis canadensis), and is known for its large, white flowers that appear in April. It grows as a multi-trunked, understory tree and has a more compact form than C. canadensis f. alba. It prefers full sun to light shade with well-drained, deep soil and can be planted as a specimen tree, or street or lawn tree in a residential area. ‘Royal White’ may be less robust in terms of disease resistance than the typical redbud. Height: 12 to 20 ft. Spread: 12 to 20 ft. This Missouri native is a deciduous small tree or shrub is great for clay soil areas with medium moisture. The name “fringe” refers to the slightly fragrant, cream-colored blossoms that droop down in clusters in May and June. A great tree in urban areas as it is tolerant of air pollution and seldom needs pruning. Spread: 20 to 32 ft.
Pagoda dogwood, a Missouri native, has very has distinctive form of tiered or layered horizontal branching. Small, fragrant blooms appear in late spring, giving way to bluish-black fruits, maturing in late summer. Leaves turn reddish-purple, tinged with yellow or green in the fall. Does well as a specimen tree or in small groupings around the home in acidic, well-drained soils. Height: 15 to 30 ft. Spread: 15 to 30 ft. This dogwood species has low branching, and a broadly-pyramidal form. It produces beautiful white bracts in early spring, and the leaves turn an attractive shade of red in the fall. The fruits are inedible, but are enjoyed by birds. This species is the state tree of Missouri. Prone to some disease issues. Not recommended for planting in areas with dogwood anthracnose problems. ‘Cherokee Chief’ is a nativar of the flowering dogwood species, producing rose-colored floral bracts in spring instead of white. It grows well in average, medium moisture soils in full sun to part shade. ‘Cherokee Princess’ is nativar known for its consistently early and heavy bloom of flowers with large white bracts. It also produces a good rust-red fall color. Popular as a specimen tree or a small grouping around homes. Prone to some diseases. Not recommended for planting in areas with dogwood anthracnose problems. This dogwood nativar provides visual interest throughout the season. In spring, the tree is covered in showy overlapping white bracts, leaves are dark green in the summer and turn reddish-purple in the fall, and the glossy red fruit is persistent into winter. A great tree around the home, near patios or lawns, or in a woodland, bird or native plant garden. Kousa dogwood is a deciduous flowering tree or multi-stemmed shrub. Bracts of this dogwood are white to pinkish, and bloom in May and June. Fruits are berry-like and mature to a pinkish-red persisting into fall. Leaves turn attractive shades of reddish-purple to scarlet in fall. Best grown in organic rich soil with an acidic to neutral pH. This species has better disease resistance and cold hardiness than flowering dogwood (Cornus florida), and is a good option where dogwood anthracnose is a problem. Chinese dogwood has a vase-shaped habit in its early years, but matures to a more rounded form. This species has slightly larger bracts, fruit, and leaves than the Cornus kousa species. In spring, it has abundant white-bracted flowers in May, red fruit in summer and showy orange-red foliage in fall. This species has better disease resistance and cold hardiness than flowering dogwood (C. florida), and is a good option where dogwood anthracnose is a problem. The ‘Golden Glory’ cultivar has more of an erect appearance, vigorous growth and higher floral abundance than the species. Clusters of dense, showy yellow flowers appear in early spring before the leaves emerge. Edible fruits mature to cherry red in mid-summer. Scaly, exfoliating bark develops on mature trunks. A good selection as a hedge, screen or specimen. May naturalize in open woodland/naturalized areas. Cornus mas is known for having excellent resistance to dogwood anthracnose and dogwood borer. This deciduous Missouri native tree or large shrub is adaptable to a wide range of soils. Its trademark characteristic is the billowy hairs of spent flower clusters which give the appearance of fluffy, smoke-like puffs of purplish-pink. In fall, the leaves turn a variety of colors including yellow, red, orange and reddish purple. It looks best when planted as a group in a shrub border. This Missouri native is small tree or shrub that is adaptable to a wide range of soils except those that are wet or poorly drained. The fruit, which appears in the fall, is very attractive to wildlife and is often the focal point of the shrub. All parts of the plant are poisonous if ingested. Grows well in woodland, native and bird gardens. The highlight of this species is its showy clusters of bell-shaped white flowers that appear in spring. The species epithet diptera refers to the flattened two-winged fruits that ripen in fall. It can easily be grown in average, medium moisture, well-drained soils in full sun to part shade. No serious insect or disease problems, and can be planted in lawns, woodland gardens and shrub borders. Spread: 8 to 15 ft. Native to the Ozarks, Ozark witch hazel prefers moist, acidic soils and does best with consistent moisture. The flowers of this species are striking, as the yellowish-red petals are crinkled and ribbon like. They appear in clusters along the stems in mid to late winter (January-March in St. Louis) before the foliage emerges. Root suckers should be removed to prevent colonial spread. A great specimen for winter interest in shrub borders and woodland gardens. Seven-son flower tolerates a wide range of soils, requires medium moisture, well-drained soil and does well in full sun. The white, fragrant clusters of flowers appear in September, and are followed by a beautiful display of fall color. The flowers are attractive to pollinators and are a good source of nectar for butterflies in the fall. The tan bark exfoliates to reveal attractive brown inner bark, providing good winter interest. A good species for shrub borders and woodland gardens. Sperad: 10 to 15 ft. The ‘Butterflies’ cultivar is known for its non-fading yellow flowers, compact pyramidal form and hardiness in heat and cold. Flowers appear in late winter to early spring and have a light lemon oil aroma. ‘Bracken’s Brown Beauty’ is a compact cultivar with a dense, narrow, pyramidal-oval crown. The glossy, leathery, evergreen leaves are approximately half the size of those on the species. Fragrant, cup-shaped white flowers appear in late spring, with sparse continued flowering throughout the summer. The cultivar is noted for its reliable winter hardiness in the St. Louis area (USDA Zones 6a to 6b). However, it is still probably best sited in a protected location. The Little Girl Series are hybrid magnolias that flower about 2-4 weeks later than star magnolia (Magnolia stellata) and saucer magnolia (M. × soulangiana), which helps to reduce the risk of damage to the flowers from late spring frosts. These cultivars grow best in neutral to slightly acidic, well-drained soils in full sun to part shade, but can tolerate clay soil. Can be used as specimen trees/shrubs for lawns, shrub borders or woodland peripheries. Height: 10 to 15 ft.
‘Betty’ is known for its shrubby habit, large deep purple-red flowers with white interiors that bloom mid-April to early May. Its leaves emerge with copper-red tints in spring, turn dark green by late spring, and acquire yellow to bronze-copper tones in fall. Tolerates air pollution. ‘Jane’ is a slow-growing, deciduous small tree or shrub that is known for its shrubby habit and large reddish-purple flowers with white interiors. It blooms from mid-April to early May before the foliage appears, and may sporadically repeat bloom in mid-summer. The ovate leaves go from dark green in spring to yellow to bronze-copper tones in the fall. ‘Randy’ is primarily noted for its narrow open habit, and reddish-purple flowers that appear in mid-April to early May. Star-shaped flowers appear before the foliage and are fragrant. Its medium green leaves turn yellow to bronze-copper in the fall. ‘Ricki’ has a compact shrubby habit with reddish-purple blooms that appear in mid-April to early May before the foliage appears. The flowers may sporadically repeat bloom in mid-summer. The foliage turns a bronze-copper in fall. Another excellent but shrubby cultivar in this series is 'Susan'. A beautiful specimen tree or small shrub with a spreading, rounded crown. It grows best in well-drained loamy soils in full sun. In late winter or early spring, the tree will be covered in star-shaped, white fragrant blooms that can reach 3 to 4 in. in diameter. Does not tolerate soil moisture extremes and most urban pollutants. The ‘Royal Star’ cultivar blooms about two weeks later than the species, making it less prone to frost damage. Its average height is 10 to 20 ft. tall and has an 8 to 15 ft. spread. Spread: 12 to 16 ft.
Upright and spreading, this easy-to-grow tree, grows best in medium moisture, well-drained acidic loams, but can tolerate a wide range of soils. In spring, the tree is covered in magenta-pink flowers, giving way to dark purple foliage which persists through the summer, and excellent orange-red fall color. Crabapple fruits mature in late summer and persist on the tree into early winter. The ROYAL RAINDROPS selection is known for its disease resistance against the major crabapple diseases. The ‘Mary Potter’ cultivar is a low-growing, broad-spreading, densely branched cultivar with reddish-pink buds that open to fragrant white flowers in spring. Crabapple fruits persist into the fall and are attractive to birds. Best grown in acidic, loamy soil with moderate moisture, but can adapt to a wide range of soils. Disease resistance is moderate. The cultivar is susceptible to apple scab, leaf spot and fire blight. Compared to other crabapple species, the ‘Prairifire’ cultivar reportedly has high disease resistance to common crabapple diseases. It grows as a dense, rounded deciduous tree requiring medium moisture and well-drained soils. In spring, the tree is covered with slightly fragrant deep pink-red flowers. Crabapple fruits mature in fall, and persist as the foliage turns to an orangish color in the fall. Height: 14 to 18 ft. Spread: 11 to 15 ft.
‘Sutyzam’ SUGAR TYME is an upright, oval deciduous tree with fragrant, single, white flowers that appear in spring. The crabapples attract birds when the fruit matures in fall. This cultivar is also known for its excellence disease resistance. It is slightly susceptible to apple scab, leaf spot, powdery mildew and fire blight. The ‘Pink Chimes’ cultivar grows as a shrubby small tree or large shrub with wide spreading horizontal branches that tend to weep at maturity. Pendulous clusters of bell-shaped, mildly fragrant, pale pink flowers appear in late spring. Gray bark fissures on older trees reveal an attractive orange inner layer, a good characteristic for winter interest. Best grown in medium moisture, acidic, well-drained soil, use as a specimen in lawns, shrub borders or an understory tree in woodland gardens. ‘Ivory Silk’ grows as a small tree or large shrub with a rounded crown. It is easily grown in average, medium moisture, well-drained soil in full sun. Creamy white, fragrant flowers in dense clusters appear in late May to early June, later than most other species of lilac. This cultivar can be planted as a specimen in the landscape and may be used as a screen along property lines. It reportedly has good resistance to some of the major pests of lilacs. This species typically grows as an open, multi-stemmed form with wide arching branches. Showy, fragrant, yellowish-white flowers appear in mid-spring and attracts butterflies, other pollinators and hummingbirds. The flowers give way to loose clusters of brown capsules that persist into winter. The reddish-brown bark is furrowed and ridged on some plants, but exfoliates attractively on others. No significant fall color. Easily grown in average, well-drained soil in full sun, and can be planted as a specimen tree or in lawns near decks and patios. Spread: 6 to 12 ft. This Missouri native is easily grown in average, dry to medium, well-drained soil in full sun to part shade. Non-fragrant white flowers appear in spring and are attractive to butterflies and other pollinators. The blue-black, berry-like drupes persist into winter and are attractive to birds and wildlife. Fruits are edible and may be eaten off the tree when ripe. The glossy, dark green leaves turn attractive shades of red and purple in fall. This species tolerates drought and has no serious insect or disease problems. Can be grown as a specimen tree or a large shrub in shrub borders, as a hedge, or used as a screen.